Palexpo, Geneva, 16th of May, Dayonix Pharma kicked off the first day in Vitafoods Europe 2018 and goes ahead on the second day! 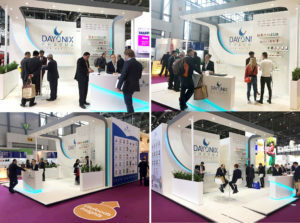 The proceedings of the 22nd annual Vitafoods Europe is continuing for the second day in Dayonix Pharma at booth #L82 in Palexpo, Geneva. The first day of the event proved to be very enjoyable and informative including a series of gatherings and meetings to exchange information and ideas in the world of supplements. On May 15, we had the pleasure to welcome more than 250 professional target audiences from all across world visiting our 15 top brands and we are looking forward to the second and third day, which promises to be just as inspirational. Follow us on our twitter @Dayonixpharma to stay updated on news.